Questions about crossing the streets keep coming back in the comment section of my videos. Some people comment that they don’t understand the lack of crosswalks on the cycle paths. Well, that’s because pedestrian crossings are perhaps less common in the Netherlands compared to other countries. As a pedestrian, you are allowed to cross the street or the cycle path wherever you like. When you are not used to that kind of freedom it is apparently not the easiest concept to follow. Dutch people had always been allowed to legally cross the street mid-block. Zebra crossings are not mandatory and even the obligation to cross in the shortest line was scrapped from the law in 1995. The latter is still advised, but – quite obvious from my video – that advice is not followed well. Crossing the street; there is not much to it in the Netherlands, so it may be perfect to tackle this subject in this short post week. If you want to cross a city street you just wait for a gap in traffic and you cross. So, isn’t there an obligation to use a zebra crossing? No, there no longer is! That article 99 was scrapped from the traffic laws on 1 January 1995. Until then, pedestrians were not allowed to cross within 30 metres of a zebra crossing, effectively making it illegal to cross the street for over 60 metres with just one zebra crossing in the middle of that zone. That restriction was abolished to simplify the traffic rules and to give the pedestrian more freedom. A zebra crossing is now just a service to the pedestrian. You are allowed to judge for yourself if you want to use it, but you are not obliged to. If you do use the zebra crossing, other traffic must yield the moment it becomes clear you are going to cross the street. Just the visible intention to use the zebra crossing already gives the pedestrian priority over motor traffic and people cycling. Unfortunately, a lot of Dutch drivers choose to forget that rule (and people cycling also tend to miss this regulation all too often) so it is best not to depend on getting that priority. 1 Drivers must give priority at all times to blind or partially sighted pedestrians carrying a white cane with one or a number of red rings around it and also to all other persons with disabilities. 2 Drivers must give way at all times to pedestrians and drivers of invalid carriages who are crossing, or obviously waiting to cross at a pedestrian crossing. 3 The second part does not apply to drivers of a motor vehicle that forms part of a military column or a motorised funeral procession. 4 Subsection 2 above does not apply if the pedestrians and the drivers of invalid carriages are prevented from crossing by either a red or a flashing amber pedestrian crossing light. What is forbidden in one jurisdiction can be encouraged in another. 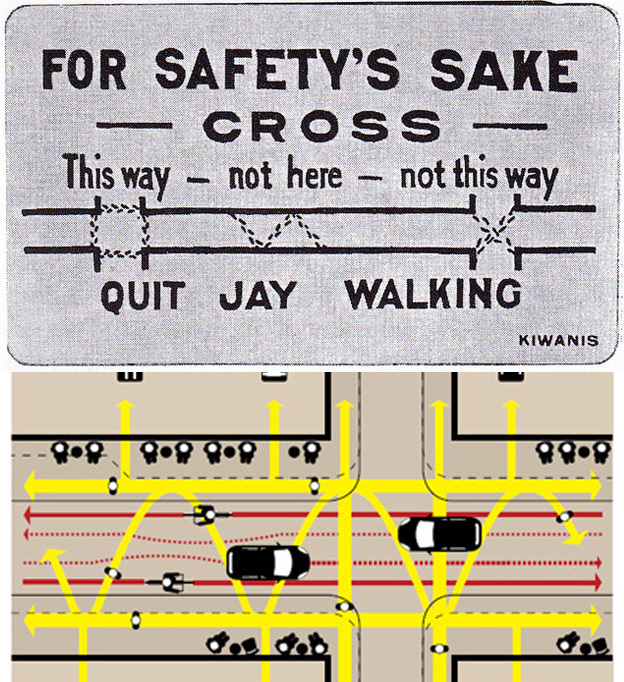 Above: a card that was handed out in the 1920s in the US to discourage ‘jay walking’. Below how the city of Utrecht would like pedestrians to use a street (yellow lines) that they reconstructed in 2014. There is no pedestrian crossing needed on this cycle path. This pedestrian is free to choose where she would like to cross it. New York was also strict in 1968. I used a well known traffic education song* from that city’s traffic department from that year for this week’s video. 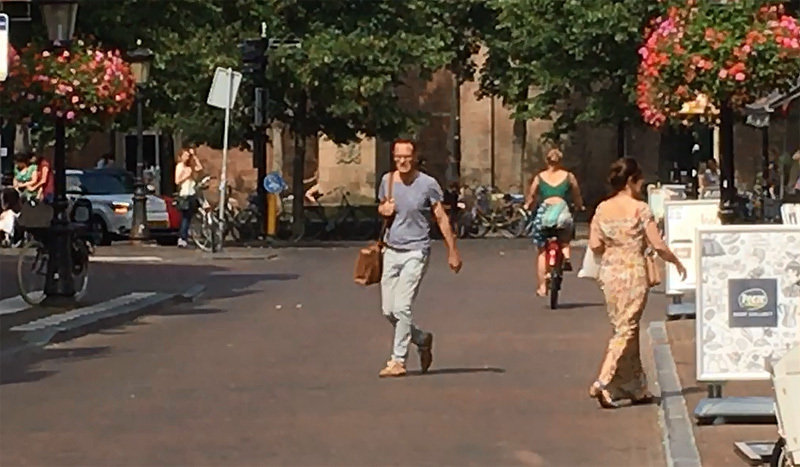 I combined that song and some sound bites from an earlier commercial about jaywalking, with images of people in the Netherlands today, who are enjoying the freedom to cross the street wherever they like. The juxtaposition makes clear why it is sometimes hard to understand traffic images from another country. Things can be so different! This week’s video shows a lot of Dutch pedestrians legally crossing the street where they like! * The song is so well known that a Dutch band recorded a version of it in 1996. Could you please tell me how the dutch deal with the vision impaired as it is such a big thing in the UK. We have dutch engineers where I work and they say they just don’t worry about it. You often have to cross a busy cycle lane before you get to the island for the signalised crossing which is for general traffic. The cycle lane is usually not signalised. Does this never come up as a problem because I cant see how it cannot? Visually impaired people with a white cane with at least one red ring have priority. Always. Same goes for all people that have difficulty with walking/movement. Art. 49 RVV. So in theory people with canes, walkers or something else of that nature have priority. Doesn’t mean they will (always) get it though. Since January 2015 you not just get fined but also get a criminal record if infringed. Thanks for the reply. That still puts a lot of people with other levels of impairment in a problem position. I would love to have a cycle lane just go round a corner but the fact the cycle lane is uncontrolled means we cannot do it (at least without a fight). I cant believe its just widely accepted that they have to get on with it in the Netherlands. They are widely accepted because the problems you fear are nonexistent. Bicycles pose far less problems because the speed is moderate and their footprint is small. On top of that they are easily maneuverable and can stop in an instant while the people waiting to cross and someone on a bicycle can look each other in the eyes and talk to one another. There is no comparison to crossing a street with motor traffic. Hi. Yes I know there is no comparison. Non at all but if you read any research into this then the whole eye contact thing does not work for the vision impaired. I am not against it. This is I want to do but people wont do in the UK and Vision Impaired groups have been upset at even mentioning it. Our desired standard for designing for these groups is very high compared to the rest of the world (even if it doesnt always appear in practice). What you are basically saying is that the dutch look at risk and think there isn’t much of one. That is great but If someone won’t leave the house because its too intimidating to cross the road then that is certainly seen as a failure over here. I would be interested to hear from someone who is vision impaired as with the volume of cyclists there is no way you can know what impact it is having on people who simply will not engage with crossing the road unless a study has been done. The fact that any incident would only be slight isn’t really the point. I need more if I am going to be able to justify this to our signal engineers. I was not clear enough. We have very high standards as well. We are the country where each and every train station is completely adapted for the visually impaired. All the signage is available in Braille too and there are guidance strips everywhere. The same goes for our crossings. The guidance strips tell the visually impaired where the cycleway crossings are. That’s needed because the kerbs are dropped, because that is again good for people in a wheel chair. The needs of all these groups are considered and that is why there are no problems. That was what I tried to say. Most modern countries have guidance strips. Sorry but that is not what I was looking for. Knowing the location of the crossing and dropped kerb is just standard. Knowing when you can cross is another story all together and this is where there appears to have been no consideration except for a risk analysis. That is fine if that’s what it is and a gentleman from the Dutch cycling embassy said as much to me at a conference. I was just surprised that there isn’t more complaints about it. How does crossing the bike path work when there are lots of pedestrians and cyclists at the junction (like in amsterdam). When pedestrians cross mid-block or outside of a marked crossing are bicyclists and motorists still required to yield? Your description of waiting for a gap seems to imply that the peds must yield, but is that the case? Also, do these rules apply on busier streets as well? If I remember the laws correctly, drivers (which in the Netherlands includes cyclists) are supposed to yield to pedestrians who are crossing the streeet. The difference with official crossing places such as zebras is that at those places a pedestrian who has not yet started crossing, but shows a clear intention of crossing also should get priority. That latter is not the case elsewhere. Practically, I don’t think jaywalking prohibitions are enforced, especially in the urbanized areas of northern Virginia around Washington, DC where there is development, commercial activity, and tax revenue! There pedestrians pop out from behind parked cars and other obstructions. Sometimes the municipality encourages it by installing midblock crosswalks that force people out from between parked cars. What alerts drivers to this potentially dangerous situation: user-activated flashing LEDs, which users usually don’t activate. While the laws are important, the engineering design really makes a difference. The Dutch seem to emphasize design. Virginia seems to be emphasizing law. It’s a short account of how the term was invented by US automobile company lobbyists – sensationalised, but accurate. This reminds me of the situation of people crossing the street in the rural towns in Tainan, Taiwan. Older folks just start to walk across the road (within smaller towns) without looking or otherwise. Vehicles just slow down to accommodate or go around. You just don’t hoot at an old person when they’re crossing the road, whether or not they “should” be crossing there. That’s rude. The one overarching issue in many comments I see is too many rules. It feeds the “I’m right, therefore you’re wrong.” thinking that’s toxic. In the video, people and bicycles are more or less just milling about. If a pedestrian comes along, the bicycle just gently swerves and people don’t get into the habit of assuming that someone must do something in a particular way, so they’re more aware overall. It also seems to promote a general calmness as opposed to the frantic stop/start of most roads that leads to accidents. PS. Thank you so much for your continuous commentary and insights. I particularly enjoy your insight into the minutiae as they are important and can oftentimes be glanced over. The exception to mid-block crossing is when there is a pedestrian crossing (both zebra and children’s type). In those areas pedestrians are not permitted to cross if we are within 20 metres of the crossing. We a required to use the crossing. An interesting variation I discovered recently. Australian and New Zealand share most of the same road rules but in Australia turning drivers must give way to pedestrians crossing at an intersection but that rule does not apply in New Zealand. The must be thousands of NZ people living in Australia who are not aware of this. Such minor differences with big consequences also exist in Europe. They can be quite dangerous if you think the rules have been standardised all over the European Union for instance. The rules are certainly not the same everywhere! Also, I personally think that if a street is busy enough that pedestrians or cyclists really need legal priority over vehicles, there is probably something wrong with the street design in the first place. This is one thing the UK has got right – you can cross anywhere you like and you can cross on a red man as well, as pedestrian signals are just advisory. Pedestrians are also allowed to walk in the road, even when a footway is available. 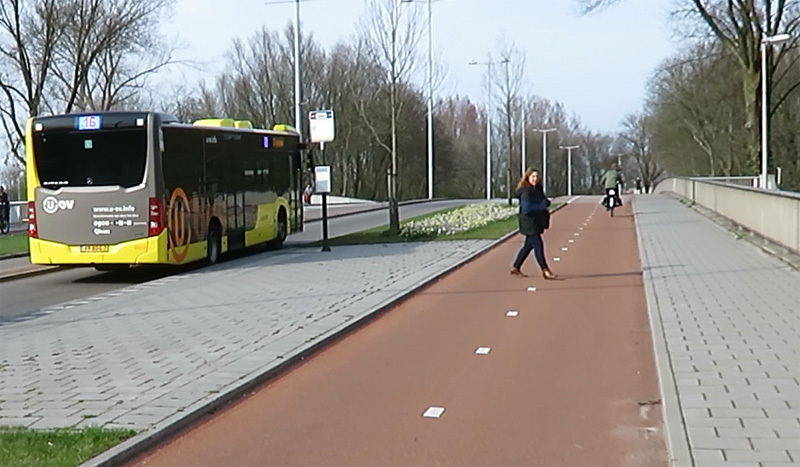 As far as I know, you are required to use the footway if one is available in the Netherlands. That’s right, the Dutch must use a footpath if there is one and crossing at a red light is forbidden. (You are only allowed to cross with care if the red light is changed into a flashing amber, as mentioned in the excerpt of the law.) So there UK pedestrians have even more freedom than the Dutch. What I really dislike in the UK though, is the fact that you do not get priority from turning drivers when you are crossing a street at a corner that they turn into. That priority is nearly always given in the Netherlands, even if you did not start the crossing yet. To a point that you do not even have to look for approaching traffic. Cross like that in the UK and you are in for a nasty surprise! England is a nasty mean place, even for walking let alone cycling. A motorist tried to run me over as I had the temerity to cross the street against the red when he was about to turn leftn and I was going to hold him ip for two seconds. IIRC there are an enormous amount of hit-and-run crashes there. Paradoxically some of the nicest, inspiring people I know of in the world are English, and most write cycling blogs and/or are members of the Cycling Embassy of Great Britain. God bless them. Yes, there’s no law to say turning drivers have to give way to pedestrians in the UK, which is my biggest bugbear as a pedestrian here. It makes crossing any side road nerve-wracking because you not only have to check what’s coming up the side road, which is the easy part, but you also have to look for cars turning right from in front and turning left from behind. If you don’t check what’s coming from behind and step out when a car is about to turn, you will get a nasty surprise, as you said! However, in my experience, many pedestrians do not check for turning traffic at side roads anyway! I think this proves that the British system doesn’t work, especially if the main road is busy, because it’s difficult to predict if a car is suddenly going to turn, as some drivers don’t indicate. There’s a campaign by British Cycling called the “Turning the Corner” campaign, which aims to get the give way when turning rule implemented in the UK. Unfortunately, I don’t see it happening any time soon. Because they are written with ‘should’ they are not laws but could be held against you in a court if the matter came down to it. Yes, drivers should give way to pedestrians already crossing (but they don’t absolutely have to), but if the pedestrian is still on the pavement, then Rule 170 doesn’t apply, whereas pedestrians still on the pavement get the priority in the Netherlands. Of course, in reality drivers ignore Rule 170 anyway and beep aggressively at pedestrians in their way. I noticed lots of fencing designed to corral pedestrians into certain areas, in videos of urban settings in the UK. Doesn’t look all that pedestrian friendly to me. There is a de-fencing policy all across the UK, especially in London, and miles of guard railings have been removed in the past 10 years. Want to see hundreds of miles of guard railings, anti-pedestrian chains and a real pedestrian hell? Visit eastern Europe: Poland, Lithuania, or Russia. 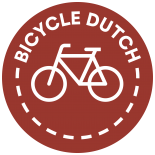 This entry was posted on 5 September 2017 by Bicycle Dutch in Original posts and tagged crossing, small things.